Tens of thousands of Russians yesterday called for strongman Vladimir Putin to resign during a historic day of protest over allegedly rigged elections. 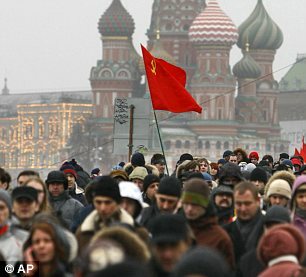 Despite a vast security clampdown, riot police and army units allowed the peaceful crowds to vent their anger in the biggest rallies the country has seen since the fall of the USSR. 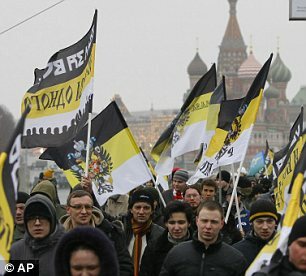 As many as 50,000 massed at Moscow’s Bolotnaya Square near the Kremlin. 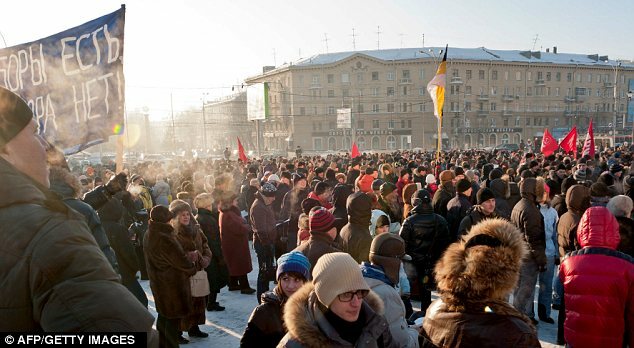 It followed demonstrations in 70 cities across the country - many held in freezing snow, where campaigners screamed 'Putin's a louse' and demanded he quit - including Siberia and the Far East. Last night, protesters issued an ultimatum to Prime Minister Putin to cancel ‘fraudulent’ parliamentary elections and stage a rerun – or face an even larger mass protest in two weeks. The authorities deployed more than 50,000 police and soldiers for yesterday’s rallies but there was no repeat of the arrests at smaller spontaneous protests earlier last week. Armoured vehicles blocked access to Red Square and government buildings around the Kremlin and tiny spy helicopters monitored the crowds. Authoritarian former KGB spy Putin – who plans to return to the Kremlin as president in March – now faces his most acute political crisis since coming to power. 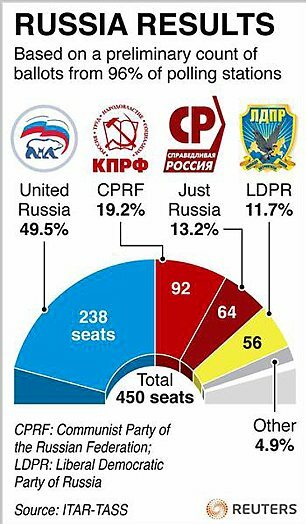 There were even calls from the crowd for Putin to be jailed over the ‘rigged’ parliamentary poll, which his United Russia party narrowly won last week, and the endemic corruption which is rampant at all levels throughout the country. 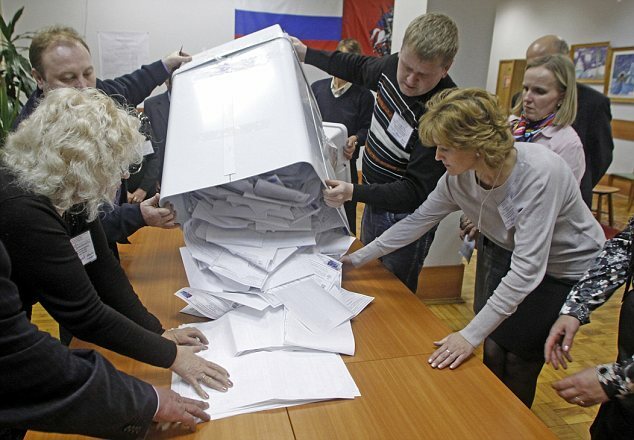 Independent observers suggest United Russia’s vote was inflated from about 25 per cent to 50 per cent of the total share, enough to give an overall majority. Exact estimates on the size of yesterday’s protest varied but there was agreement it is the largest Putin has seen. As the protests unfolded, the websites of Russia’s two major state-run channels ignored developments in an act of Soviet-style censorship. 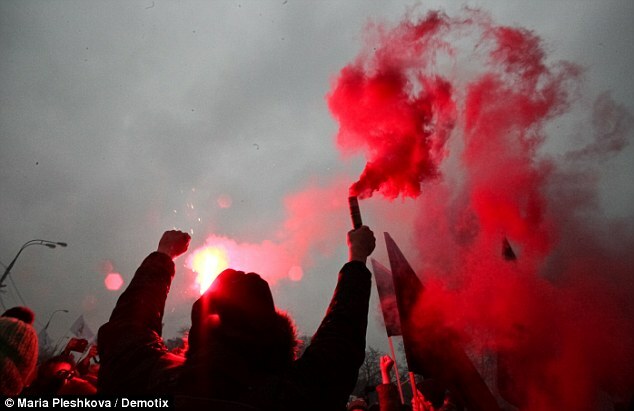 In London, protesters chanted slogans and displayed banners outside the Houses of Parliament. 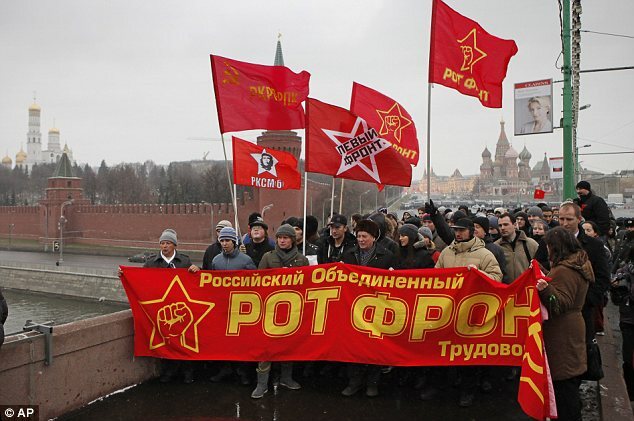 And Moscow rally organiser, opposition politician Vladimir Ryzhkov, has announced there will be another protest on December 24, which he says will be twice as large. 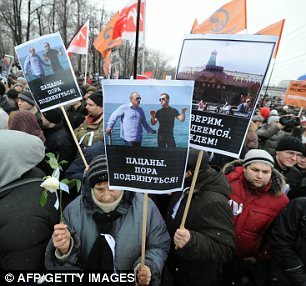 The protests come three months before Putin, who was president from 2000 to 2008 and effectively remained the country's leader while prime minister, is to seek a third term in office. The public outpouring challenges his image, supported by state-controlled TV channels, as a man who won the affection of most Russians. That image was undercut by last Sunday's parliamentary elections, during which his United Party narrowly retained a majority of seats. But it lost the unassailable two-thirds majority it held in the previous parliament. Even that reduced performance was unearned, inflated by massive vote fraud, the opposition says, citing reports by local and international monitors of widespread violations. The reports of vote-rigging and the party's loss of seats acted as a catalyst for long-simmering discontent of many Russians. 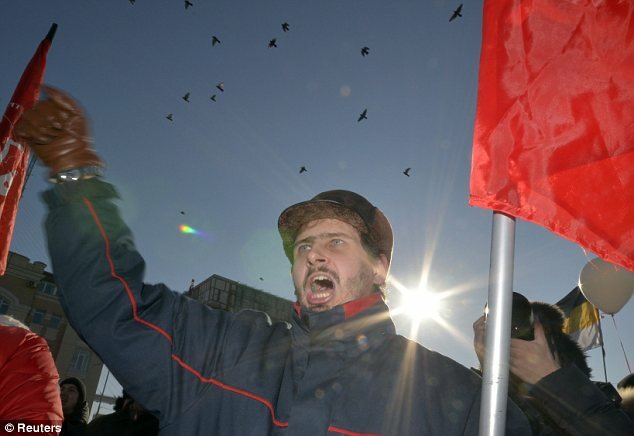 'The falsifications that authorities are doing today have turned the country into a big theater, with clowns like in a circus,' said Alexander Trofimov, one of the early arrivals for the protest at Bolotnaya Square, on an island in the Moscow River adjacent to the Kremlin. 'I don't think any citizen of the country can say he is very happy with anything. We don't have an independent judiciary, there is no freedom of expression - all this combined creates a situation where people are forced to protest,' said demonstrator Albert Yusupov, who was dressed in civilian clothes but identified himself as a member of the Russian army. By the time the rally started, the square and adjacent streets were packed shoulder-to-shoulder with protesters braving intermittent wind-blown snow. City authorities have given permission for a rally of up to 30,000 people, unusual largesse for an opposition that generally is either denied permission to rally or limited to small numbers. It was not clear if police would choose to crack down if the crowd clearly exceeded 30,000. But they did try to move demonstrators off a footbridge leading to the island, claiming it was so packed with people that it could collapse. Protests took place in at least 15 other cities from the Pacific Coast to the southwest. 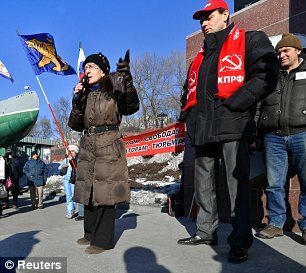 In the Pacific city of Vladivostok, several hundred protesters rallied along a waterside avenue where some of Russia's Pacific Fleet warships are docked. 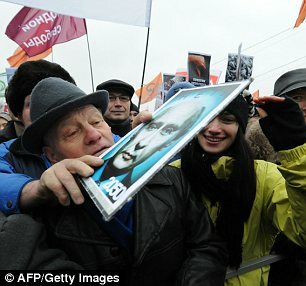 They shouted 'Putin's a louse' and some held a banner caricaturing United Russia's emblem, reading 'The rats must go'. 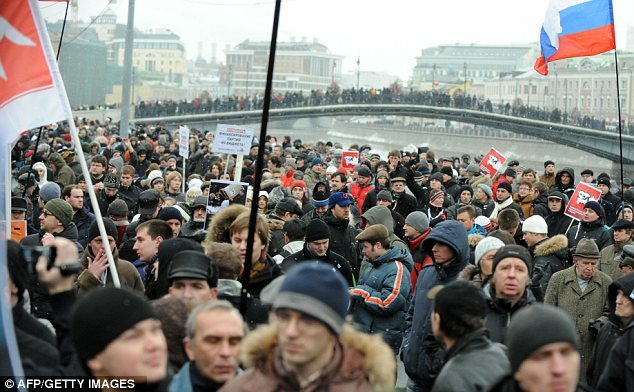 And in the eastern city of St Petersburg, observers said more than 10,000 took to the streets. Police stayed on the fringes of that demonstration and made no arrests. 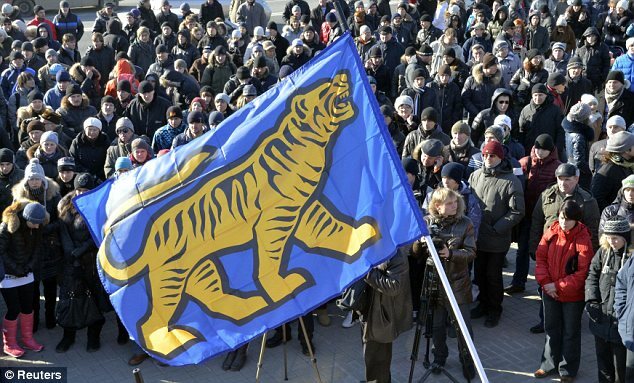 But the Interfax news agency reported that about 15 people were arrested at a protest in the Siberian city of Perm and about 30 in the Far Eastern city of Khabarovsk when a flash-mob started an unauthorized protest. 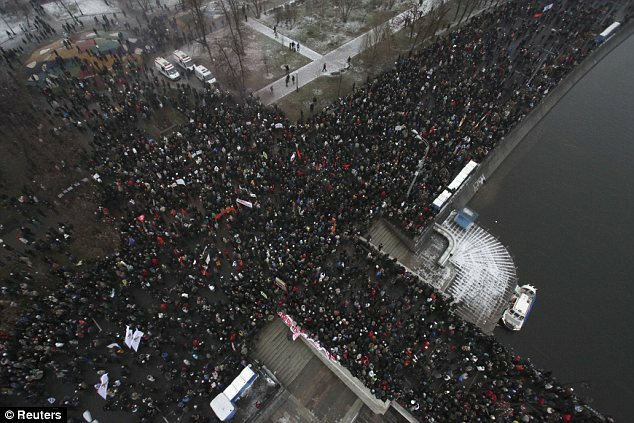 Officials in many cities, including Moscow, gave permission for the protests. But in what appeared to be an attempt to prevent young people from attending the protest, Moscow's school system declared Saturday afternoon a mandatory extra school day for grades 9-11. Students were told of the decision only on Friday, news reports said. Hundreds of people, were arrested in smaller protests earlier in the week. 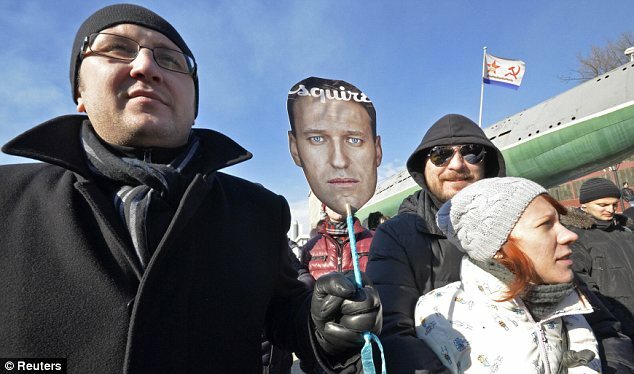 Some, including prominent opposition blogger Alexei Navalny, were sentenced to 15 days in jail. 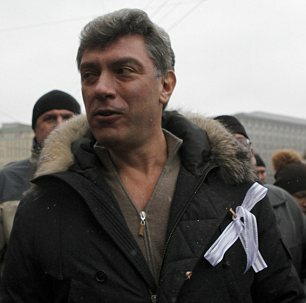 Another prominent opposition figure, Sergei Udaltsov, was hospitalized after his Monday arrest and was expected to be released Saturday, but the Interfax news agency said he was taken from the hospital to a court to face further charges. President Dmitry Medvedev conceded this week that election law may have been violated and Putin suggested 'dialogue with the opposition-minded' - breaking from his usual authoritarian image. The Kremlin has come under strong international pressure, with U.S. Secretary of State Hillary Clinton calling the vote unfair and urging an investigation into fraud. 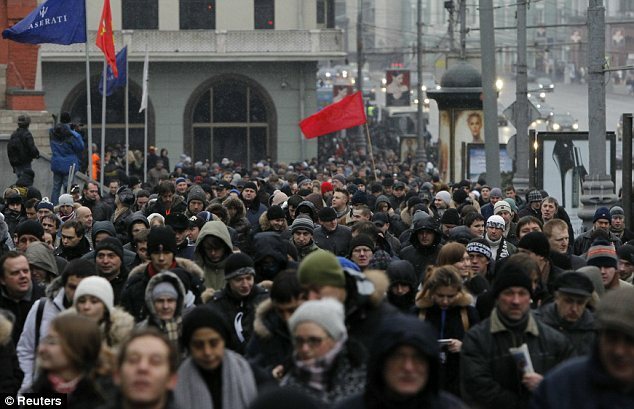 The opposition predicts at least 30,000 demonstrators will assemble for the Moscow protest. If today's protests are a success, the activists then face the challenge of long-term strategy. Even though U.S. Sen. John McCain recently tweeted to Putin that 'the Arab Spring is coming to a neighborhood near you', things in Russia are not that simple. 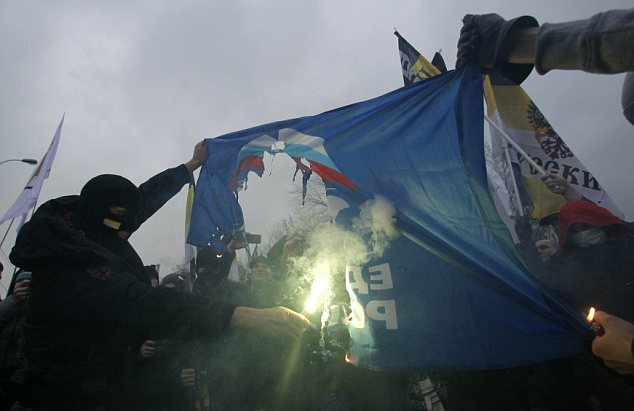 The popular uprisings that brought down governments in Georgia in 2003, in Ukraine the next year and in Egypt last spring all were significantly boosted by demonstrators being able to establish round-the-clock presences, notably in Cairo's Tahrir Square and the massive tent camp on Kiev's main avenue. 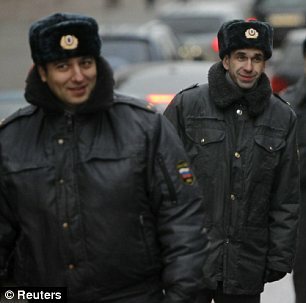 Russian police would hardly tolerate anything similar. 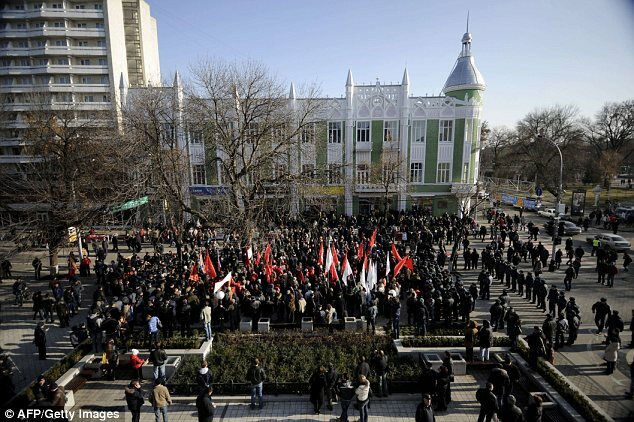 In Ukraine and Georgia, police were low-profile, staying on the edges of the protests and keeping their numbers small. It is seen as a far cry from Russian police's usual crowd-controlling method of flooding any protest zone with hundreds of helmeted police who seem to relish violence. Opposition figures indicated today that the next step would be to call another protest in Moscow for next weekend, with the aim of making it even bigger. But staged events at regular intervals may be less effective than daily spontaneous protests. The opposition is also vulnerable to attacks on the websites and social media that have nourished the protests. This week, an official of Vkontakte, a Russian social networking site, reported pressure from the FSB, the KGB's main successor, to block access to opposition groups, but said his company refused. On election day, the websites of a main independent radio station and the country's only independent election-monitoring group fell victim to denial-of-service hacker attacks. "Eastern newspapers often publish unchecked and prejudiced information" - sorry, it's my mistake but I was going to write Western ones. Slowly, but, surely, the organizers of these protest marches will begin to disappear. Never to be seen again. It's just a matter of time. Putin, will see to that. 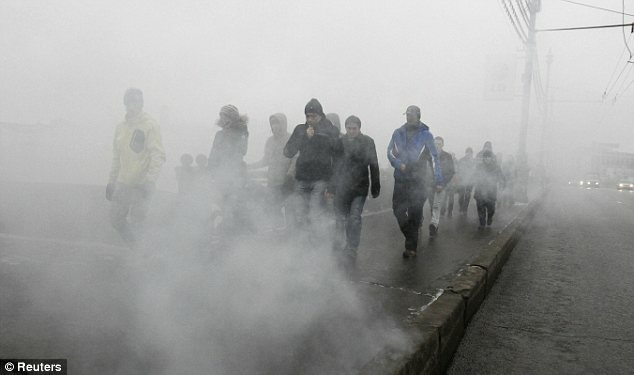 As Russia people have had a habit in the past 100 years of just disappear for no reason. So it's no big deal. Only family members look for them. Never to find them. Alive, at least. Communism, still reigns supreme in Russia. And will, as long as the old guard are still around. You can't change the spots on a Leopard. Never trust a Russian politician...or any other kind! But Putin just want to the the little biddy kingy wingy forever! His wee-wee must be very teeny! LOL Rotten commies and socialist leaders. Chris Fiji -- how are things there? 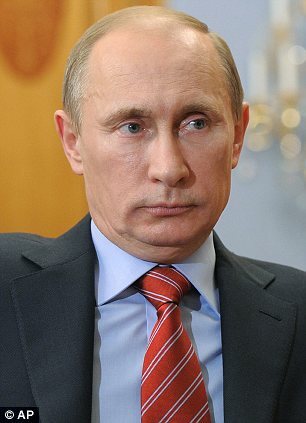 Putin has lost popularity -fact, just did not show at the polls, funny that. 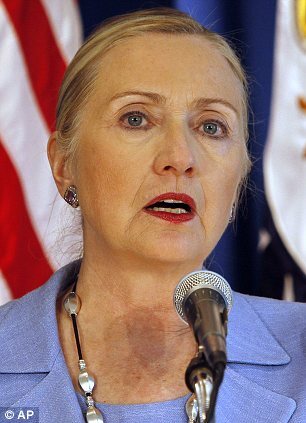 Bet the face-lift didn't help! Well done everyone who came to protest and who cares about what happens to their country. Many people were afraid of violence but there was no violence in Moscow, and some protestors said "Moscow police for the first time behaved like police in a democratic country should." Russia is not Ukraine, and it was not "a revolution". It was a peaceful protest to send the message to the government that people are disillusioned and disappointed. Barbra Streisand 'threatens to sue' ex-Real Housewives star Jill Zarin over video post You don't want to mess with Babs! Archaeologists unveil bones of 'biggest dinosaur in U.S.